Size Of The Table: 290cmx80cmx15cm high (Total height 80cm). 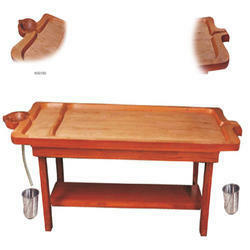 Product description: Hardwood constructed Massage Table with storage cabinets has a slanted & curved, wooden top for full body oil massage and Shirodhara. Dharapathy can be used for Abhyanga, Shirodhara & Nasyam etc. Catering to the requirements of our clients, we are involved in offering Designer Steam Bath Chamber. Our reputed entity is engaged in supplying Shirodhara Head Attachment. Massage Table - Venga Wood - Plain Massage therapists conduct massage by making the recipient lie down on a massage table. Hence massage tables assume a lot of significance. Massage tables should not only be comfortable for the recipients but also ensure working convenience for massage therapists.